For the battle fought in 1918, see Second Battle of the Somme. 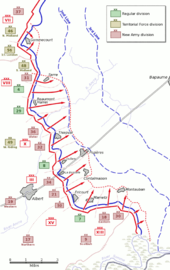 Allied war strategy for 1916 was decided at the Chantilly Conference from 6–8 December 1915. Simultaneous offensives on the Eastern Front by the Russian army, on the Italian Front by the Italian army, and on the Western Front by the Franco-British armies, were to be carried out to deny time for the Central Powers to move troops between fronts during lulls. In December 1915, General Sir Douglas Haig replaced Field Marshal Sir John French as Commander-in-Chief of the BEF. Haig favoured a British offensive in Flanders close to BEF supply routes, to drive the Germans from the Belgian coast and end the U-boat threat from Belgian waters. Haig was not formally subordinate to Marshal Joseph Joffre but the British played a lesser role on the Western Front and complied with French strategy. In January 1916, Joffre had agreed to the BEF making its main effort in Flanders, but in February 1916 it was decided to mount a combined offensive where the French and British armies met, astride the Somme River in Picardy before the British offensive in Flanders. A week later the Germans began an offensive against the French at Verdun. The costly defence of Verdun forced the French army to commit divisions intended for the Somme offensive, eventually reducing the French contribution to 13 divisions in the Sixth Army, against 20 British divisions. By 31 May, the ambitious Franco-British plan for a decisive victory, had been reduced to a limited offensive to relieve pressure on the French at Verdun with a battle of attrition on the Somme. The Chief of the German General Staff, Erich von Falkenhayn, intended to end the war by splitting the Anglo-French Entente in 1916, before its material superiority became unbeatable. Falkenhayn planned to defeat the large amount of reserves which the Entente could move into the path of a breakthrough, by threatening a sensitive point close to the existing front line and provoking the French into counter-attacking German positions. 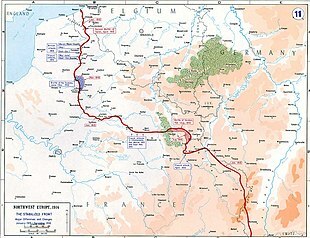 Falkenhayn chose to attack towards Verdun to take the Meuse heights and make Verdun untenable. The French would have to conduct a counter-offensive on ground dominated by the German army and ringed with masses of heavy artillery, leading to huge losses and bring the French army close to collapse. The British would then have to begin a hasty relief offensive and would also suffer huge losses. Falkenhayn expected the relief offensive to fall south of Arras against the Sixth Army and be destroyed. (Despite the certainty by mid-June of an Anglo-French attack on the Somme against the Second Army, Falkenhayn sent only four divisions, keeping eight in the western strategic reserve. No divisions were moved from the Sixth Army, despite it holding a shorter line with ​17 1⁄2 divisions and three of the reserve divisions in the Sixth Army area. The maintenance of the strength of the Sixth Army, at the expense of the Second Army on the Somme, indicated that Falkenhayn intended the counter-offensive against the British to be made north of the Somme front, once the British offensive had been shattered.) If such Franco-British defeats were not enough, Germany would attack the remnants of both armies and end the western alliance for good. 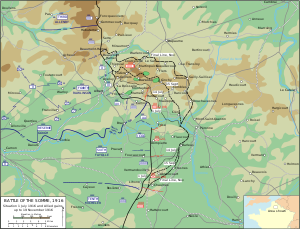 The unexpected length of the Verdun offensive, and the need to replace many exhausted units at Verdun, depleted the German strategic reserve placed behind the Sixth Army, which held the Western Front from Hannescamps, 18 km (11 mi) south-west of Arras to St. Eloi, south of Ypres and reduced the German counter-offensive strategy north of the Somme, to one of passive and unyielding defence. The Battle of Verdun (21 February–16 December 1916) began a week after Joffre and Haig agreed to mount an offensive on the Somme. The German offensive at Verdun was intended to threaten the capture of the city and induce the French to fight an attrition battle, in which German advantages of terrain and firepower would cause the French disproportionate casualties. The battle changed the nature of the offensive on the Somme, as French divisions were diverted to Verdun, and the main effort by the French diminished to a supporting attack for the British. German overestimation of the cost of Verdun to the French contributed to the concentration of German infantry and guns on the north bank of the Somme. By May, Joffre and Haig had changed their expectations of an offensive on the Somme, from a decisive battle to a hope that it would relieve Verdun and keep German divisions in France, which would assist the Russian armies conducting the Brusilov Offensive. The German offensive at Verdun was suspended in July, and troops, guns, and ammunition were transferred to Picardy, leading to a similar transfer of the French Tenth Army to the Somme front. Later in the year, the Franco-British were able to attack on the Somme and at Verdun sequentially and the French recovered much of the ground lost on the east bank of the Meuse in October and December. The Brusilov Offensive (4 June – 20 September), absorbed the extra forces that had been requested on 2 June by Fritz von Below, commanding the German Second Army, for a spoiling attack on the Somme. On 4 June, Russian armies attacked on a 200 mi (320 km) front, from the Romanian frontier to Pinsk and eventually advanced 93 mi (150 km), reaching the foothills of the Carpathian mountains, against German and Austro-Hungarian troops of Armeegruppe von Linsingen and Armeegruppe Archduke Joseph. During the offensive the Russians inflicted c. 1,500,000 losses including c. 407,000 prisoners. Three divisions were ordered from France to the Eastern Front on 9 June and the spoiling attack on the Somme was abandoned. Only four more divisions were sent to the Somme front before the Anglo-French offensive began, bringing the total to ​10 1⁄2 divisions. Falkenhayn, and then Hindenburg and Ludendorff, were forced to send divisions to Russia throughout the summer to prevent a collapse of the Austro-Hungarian army and then to conduct a counter-offensive against Romania, which declared war against the Central Powers on 27 August. In July there were 112 German divisions on the Western Front and 52 divisions in Russia and in November there were 121 divisions in the west and 76 divisions in the east. Men of the 10th (Service) Battalion, East Yorkshire Regiment of the 31st Division marching to the front line, 28 June 1916. The original British Expeditionary Force (BEF) of six divisions and the Cavalry Division, had lost most of the army's pre-war regular soldiers in the battles of 1914 and 1915. The bulk of the army was made up of volunteers of the Territorial Force and Lord Kitchener's New Army, which had begun forming in August 1914. Rapid expansion created many vacancies for senior commands and specialist functions, which led to many appointments of retired officers and inexperienced newcomers. In 1914, Douglas Haig had been a lieutenant-general in command of I Corps and was promoted to command the First Army in early 1915 and then the BEF in December, which eventually comprised five armies with sixty divisions. The swift increase in the size of the army reduced the average level of experience within it and created an acute equipment shortage. Many officers resorted to directive command, to avoid delegating to novice subordinates, although divisional commanders were given great latitude in training and planning for the attack of 1 July, since the heterogeneous nature of the 1916 army made it impossible for corps and army commanders to know the capacity of each division. Despite considerable debate among German staff officers, Erich von Falkenhayn continued the policy of unyielding defence in 1916. Falkenhayn implied after the war that the psychology of German soldiers, shortage of manpower, and lack of reserves made the policy inescapable, as the troops necessary to seal off breakthroughs did not exist. High losses incurred in holding ground by a policy of no retreat were preferable to higher losses, voluntary withdrawals, and the effect of a belief that soldiers had discretion to avoid battle. When a more flexible policy was substituted later, decisions about withdrawal were still reserved to army commanders. On the Somme front, Falkenhayn's construction plan of January 1915 had been completed. Barbed wire obstacles had been enlarged from one belt 5–10 yards (4.6–9.1 m) wide to two, 30 yards (27 m) wide and about 15 yards (14 m) apart. Double and triple thickness wire was used and laid 3–5 feet (0.91–1.52 m) high. The front line had been increased from one trench line to three, 150–200 yards (140–180 m) apart, the first trench occupied by sentry groups, the second (Wohngraben) for the bulk of the front-trench garrison and the third trench for local reserves. The trenches were traversed and had sentry-posts in concrete recesses built into the parapet. Dugouts had been deepened from 6–9 feet (1.8–2.7 m) to 20–30 feet (6.1–9.1 m), 50 yards (46 m) apart and large enough for 25 men. An intermediate line of strongpoints (the Stützpunktlinie) about 1,000 yards (910 m) behind the front line was also built. Communication trenches ran back to the reserve line, renamed the second line, which was as well-built and wired as the first line. The second line was beyond the range of Allied field artillery, so as to force an attacker to stop and move field artillery forward before assaulting the line. 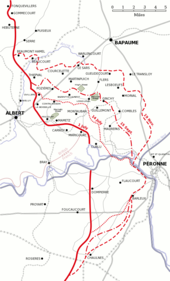 The Fourth Army attacked the German second defensive position from the Somme past Guillemont and Ginchy, north-west along the crest of the ridge to Pozières on the Albert–Bapaume road. The objectives of the attack were the villages of Bazentin le Petit, Bazentin le Grand and Longueval which was adjacent to Delville Wood, with High Wood on the ridge beyond. The attack was made by four divisions on a front of 6,000 yd (5.5 km) at 3:25 a.m. after a five-minute hurricane artillery bombardment. Field artillery fired a creeping barrage and the attacking waves pushed up close behind it in no man's land, leaving them only a short distance to cross when the barrage lifted from the German front trench. Most of the objective was captured and the German defence south of the Albert–Bapaume road put under great strain but the attack was not followed up due to British communication failures, casualties and disorganisation. The Battle of Fromelles was a subsidiary attack to support the Fourth Army on the Somme 80 km (50 mi) to the south, to exploit any weakening of the German defences opposite. Preparations for the attack were rushed, the troops involved lacked experience in trench warfare and the power of the German defence was "gravely" underestimated, the attackers being outnumbered 2:1. On 19 July, von Falkenhayn had judged the British attack to be the anticipated offensive against the 6th Army. Next day Falkenhayn ordered the Guard Reserve Corps to be withdrawn to reinforce the Somme front. The Battle of Fromelles had inflicted some losses on the German defenders but gained no ground and deflected few German troops bound for the Somme. The attack was the debut of the Australian Imperial Force on the Western Front and, according to McMullin, "the worst 24 hours in Australia's entire history". Of 7,080 BEF casualties, 5,533 losses were incurred by the 5th Australian Division; German losses were 1,600–2,000, with 150 taken prisoner. The Battle of Delville Wood was an operation to secure the British right flank, while the centre advanced to capture the higher lying areas of High Wood and Pozières. After the Battle of Albert the offensive had evolved to the capture of fortified villages, woods, and other terrain that offered observation for artillery fire, jumping-off points for more attacks, and other tactical advantages. The mutually costly fighting at Delville Wood eventually secured the British right flank and marked the Western Front debut of the South African 1st Infantry Brigade (incorporating a Southern Rhodesian contingent), which held the wood from 15–20 July. When relieved the brigade had lost 2,536 men, similar to the casualties of many brigades on 1 July. The Battle of Guillemont was an attack on the village which was captured by the Fourth Army on the first day. Guillemont was on the right flank of the British sector, near the boundary with the French Sixth Army. German defences ringed the British salient at Delville Wood to the north and had observation over the French Sixth Army area to the south towards the Somme river. The German defence in the area was based on the second line and numerous fortified villages and farms north from Maurepas at Combles, Guillemont, Falfemont Farm, Delville Wood and High Wood, which were mutually supporting. The battle for Guillemont was considered by some observers to be the supreme effort of the German army during the battle. Numerous meetings were held by Joffre, Haig, Foch, General Sir Henry Rawlinson (commander of the British Fourth Army) and Fayolle to co-ordinate joint attacks by the four armies, all of which broke down. A pause in Anglo-French attacks at the end of August, coincided with the largest counter-attack by the German army in the Battle of the Somme. In the Battle of Ginchy the 16th Division captured the German-held village. Ginchy was 1.5 km (0.93 mi) north-east of Guillemont, at the junction of six roads on a rise overlooking Combles, 4 km (2.5 mi) to the south-east. After the end of the Battle of Guillemont, British troops were required to advance to positions which would give observation over the German third position, ready for a general attack in mid-September. British attacks from Leuze Wood northwards to Ginchy had begun on 3 September, when the 7th Division captured the village and was then forced out by a German counter-attack. The capture of Ginchy and the success of the French Sixth Army on 12 September, in its biggest attack of the battle of the Somme, enabled both armies to make much bigger attacks, sequenced with the Tenth and Reserve armies, which captured much more ground and inflicted c. 130,000 casualties on the German defenders during the month. 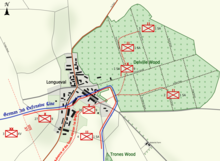 The Battle of Flers–Courcelette was the third and final general offensive mounted by the British Army, which attacked an intermediate line and the German third line to take Morval, Lesboeufs and Gueudecourt, which was combined with a French attack on Frégicourt and Rancourt to encircle Combles and a supporting attack on the south bank of the Somme. The strategic objective of a breakthrough was not achieved but the tactical gains were considerable, the front line being advanced by 2,500–3,500 yards (2,300–3,200 m) and many casualties were inflicted on the German defenders. 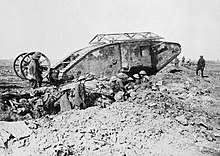 The battle was the debut of the Canadian Corps, the New Zealand Division and tanks of the Heavy Branch of the Machine Gun Corps on the Somme. At the start of 1916, most of the British Army was an inexperienced and patchily trained mass of volunteers. The Somme was the major test for Kitchener's Army, created by Lord Kitchener's call for recruits at the start of the war. The British volunteers were often the fittest, most enthusiastic, and best educated citizens, but were also inexperienced soldiers, and it has been claimed that their loss was of lesser military significance than the losses of the remaining peacetime-trained officers and men of the Imperial German Army. British casualties on the first day were the worst in the history of the British Army, with 57,470 British casualties, 19,240 of whom were killed. British survivors of the battle had gained experience, and the BEF learned how to conduct the mass industrial warfare which the continental armies had been fighting since 1914. The continental powers had begun the war with trained armies of regulars and reservists, which were wasting assets. Crown Prince Rupprecht of Bavaria wrote, "What remained of the old first-class peace-trained German infantry had been expended on the battlefield". A war of attrition was a logical strategy for Britain against Germany, which was also at war with France and Russia. A school of thought holds that the Battle of the Somme placed unprecedented strain on the German army and that after the battle it was unable to replace casualties like-for-like, which reduced it to a militia. After the Battle of the Ancre (13–18 November 1916), British attacks on the Somme front were stopped by the weather and military operations by both sides were mostly restricted to survival in the rain, snow, fog, mud fields, waterlogged trenches and shell-holes. As preparations for the offensive at Arras continued, the British attempted to keep German attention on the Somme front. 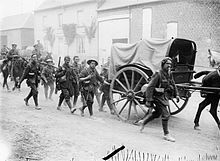 British operations on the Ancre from 10 January – 22 February 1917, forced the Germans back 5 mi (8.0 km) on a 4 mi (6.4 km) front, ahead of the schedule of the Alberich Bewegung (Alberich Manoeuvre/Operation Alberich) and eventually took 5,284 prisoners. On 22/23 February, the Germans fell back another 3 mi (4.8 km) on a 15 mi (24 km) front. The Germans then withdrew from much of the R. I Stellung to the R. II Stellung on 11 March, forestalling a British attack, which was not noticed by the British until dark on 12 March; the main German withdrawal from the Noyon salient to the Hindenburg Line (Operation Alberich) commenced on schedule on 16 March. Defensive positions held by the German army on the Somme after November 1916 were in poor condition; the garrisons were exhausted and censors of correspondence reported tiredness and low morale in front-line soldiers. The situation left the German command doubtful that the army could withstand a resumption of the battle. 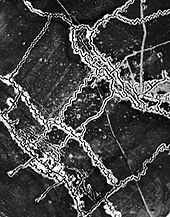 The German defence of the Ancre began to collapse under British attacks, which on 28 January 1917 caused Rupprecht to urge that the retirement to the Siegfriedstellung (Hindenburg Line) begin. Ludendorff rejected the proposal the next day, but British attacks on the First Army — particularly the Action of Miraumont (also known as the Battle of Boom Ravine, 17–18 February) — caused Rupprecht on the night of 22 February to order a preliminary withdrawal of c. 4 mi (6.4 km) to the R. I Stellung (R. I Position). On 24 February the Germans withdrew, protected by rear guards, over roads in relatively good condition, which were then destroyed. The German withdrawal was helped by a thaw, which turned roads behind the British front into bogs and by disruption to the railways which supplied the Somme front. On the night of 12 March, the Germans withdrew from the R. I Stellung between Bapaume and Achiet le Petit and the British reached the R. II Stellung (R. II Position) on 13 March. 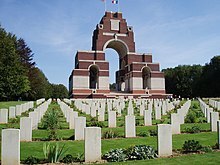 The Royal British Legion with the British Embassy in Paris and the Commonwealth War Graves Commission, commemorate the battle on 1 July each year, at the Thiepval Memorial to the Missing of the Somme. For their efforts on the first day of the battle, The 1st Newfoundland Regiment was given the name "The Royal Newfoundland Regiment" by George V on 28 November 1917. The first day of the Battle of the Somme is commemorated in Newfoundland, remembering the "Best of the Best" at 11 am on the Sunday nearest to 1 July. The Somme is remembered in Northern Ireland due to the participation of the 36th (Ulster) Division and commemorated by veterans' groups and by unionist/Protestant groups such as the Orange Order. The British Legion and others commemorate the battle on 1 July. On 1 July 2016, at 7:28 am British Summer Time, the UK observed a two minute silence to mark the start of the battle which began 100 years earlier. A special ceremony was broadcast on BBC1 and all BBC radio stations participated in the silence. At the start of the silence, the King's Troop, Royal Horse Artillery fired a gun every four seconds for one hundred seconds and a whistle was blown to end it. Just like a Remembrance Sunday silence, a bugler played The Last Post after the silence. The silence was announced during a speech by the Prime Minister David Cameron who said, "There will be a national two-minute silence on Friday morning. I will be attending a service at the Thiepval Memorial near the battlefield, and it's right that the whole country pauses to remember the sacrifices of all those who fought and lost their lives in that conflict." On 1 July 2016, a ceremony was held in Heaton Park in north Manchester in England. Heaton Park was the site of a large army training camp during the war. Across Britain on 1 July 2016, 1400 actors dressed in replica World War I-period British Army uniforms walked about in streets and public open areas, from 7 am to 7 pm. Each took on temporarily the identity of a British soldier who died on the first day of the Somme, and handed out information cards about that soldier. They did not talk, except for occasionally singing "We're here because we're here" to the tune of Auld Lang Syne. This event was called "Ghost Soldiers". Haig and General Rawlinson have been criticised ever since 1916 for the human cost of the battle and for failing to achieve their territorial objectives. On 1 August 1916 Winston Churchill criticised the British Army's conduct of the offensive to the British Cabinet, claiming that though the battle had forced the Germans to end their offensive at Verdun, attrition was damaging the British armies more than the German armies. Though Churchill was unable to suggest an alternative, a critical view of the British on the Somme has been influential in English-language writing ever since. As recently as 2016, historian Peter Barton argued in a series of three television programmes that the Battle of the Somme should be regarded as a German defensive victory. In current secondary education, the Battle of the Somme is barely mentioned in German school curricula, while it features prominently in the United Kingdom. In many British schools, variations of the question "Does Haig deserve to be called 'The Butcher of the Somme'?" (Year 9) or "To what extent can Sir Douglas Haig be considered either a butcher or a hero of the First World War?" (GCSE) are used to teach pupils historical empathy, evaluation and argumentative writing skills. ^ a b Sheldon 2005, p. 398. ^ a b c d e Sheffield 2011, pp. 194, 197. ^ a b c d e f Philpott 2009, pp. 602–603. ^ a b c Doughty 2005, p. 309. ^ a b c d e f Harris 2008, p. 271. ^ a b c Wendt 1931, p. 246. ^ Hirst, Andrew (3 July 2016). "Battle of the Somme was probably worst ever military disaster". examiner.co.uk. Retrieved 9 August 2016. ^ Frum, David (1 July 2016). "The Lessons of the Somme". The Atlantic. Retrieved 1 September 2018. ^ "Battle of the Somme Facts". ^ "The Battle of the Somme: 141 Days of Horror". ^ Henniker 2009, p. 179. ^ a b c d e f Miles 1938, p. xv. ^ a b Prior & Wilson 2005, pp. 300–301. ^ Henniker 2009, p. 161. ^ a b Churchill 1938, pp. 1427, 1004. ^ Wilcock, David. "Battle of the Somme to be commemorated with two-minute silence". The Independent. Retrieved 1 July 2016. ^ Daily Telegraph Saturday 2 July 2016, bottom of page 1, with photograph. ^ On the German historiography see Foley, Robert T. (2011). "Learning War's Lessons: The German Army and the Battle of the Somme 1916". Journal of Military History. 75 (2): 471–504. ISSN 1543-7795. ^ On British historiography see Philpott, William (2006). "The Anglo–French Victory on the Somme". Diplomacy & Statecraft. 17 (4): 731–751. ISSN 1557-301X. , Deverell, Christopher (Spring 2005). "X. Haig versus Rawlinson-Manoeuvre versus Attrition: The British Army on the Somme, 1916". Defense Studies. 5 (1): 124–137. OCLC 55201531. , and Coleman, Joseph (2014). "Historiographical Essay on the Battle of the Somme". Retrieved 26 February 2015. ^ "The Somme from the German side of the wire (From The Northern Echo)". Thenorthernecho.co.uk. Retrieved 1 August 2016. ^ For examples, see here, access date 9 August 2016. Simpson, A. (2001). The Operational Role of British Corps Command on the Western Front 1914–18 (2005 ed.). London: Spellmount. ISBN 1-86227-292-1. Retrieved 19 July 2014. Steele, O. W. (2003). Facey-Crowther, D. R. (ed.). Lieutenant Owen William Steele of the Newfoundland Regiment: Diary and Letters. Montreal: McGill-Queen's University Press. ISBN 0-7735-2428-2. Retrieved 8 August 2014. McMullin, R. (2006). "Disaster at Fromelles". Wartime Magazine. AU: Australian War Memorial. ISSN 1328-2727. Archived from the original on 9 June 2007. Retrieved 14 April 2007. "The South Africans at Delville Wood". Military History Journal (S Afr MHJ). The South African Military History Society. ISSN 0026-4016. Archived from the original on 25 July 2009. Retrieved 23 July 2009. "The Somme in Oral Histories of the First World War: Veterans 1914–1918". Ottawa: Library and Archives Canada. OCLC 439730254. Retrieved 9 September 2009. Buchan, J. (1917). The Battle of the Somme. New York: George H. Doran. OCLC 699175025. Retrieved 15 December 2014. Histories of Two Hundred and Fifty-One Divisions of the German Army which Participated in the War (1914–1918). Washington: United States Army, American Expeditionary Forces, Intelligence Section. 1920. ISBN 5-87296-917-1. Retrieved 13 September 2013. Jones, H. A. (2002) . The War in the Air, Being the Story of the Part Played in the Great War by the Royal Air Force. II (N & M Press ed.). London: Clarendon Press. ISBN 1-84342-413-4. Retrieved 9 August 2014. Masefield, J. (1917). The Old Front Line. New York City: Macmillan. OCLC 1183536. Retrieved 27 June 2013. Mitchell, S. B. T. (2013). An Inter-Disciplinary Study of Learning in the 32nd Division on the Western Front, 1916–1918 (pdf) (PhD). University of Birmingham. OCLC 894593861. Retrieved 1 December 2014. Nicholson, G. W. L. (1962). Canadian Expeditionary Force 1914–1919 (PDF). Official History of the Canadian Army in the First World War. Ottawa: Queen's Printer and Controller of Stationary. OCLC 557523890. Retrieved 27 December 2012. Statistics of the Military Effort of the British Empire During the Great War 1914–1920 (1st ed.). London: HMSO. 1922. OCLC 1318955. Retrieved 27 June 2013.